The diamond used in any jewellery creation can easily account for up to 90% of its value, but its’ brilliance can only truly be brought to life in the right diamond setting. What is a diamond setting exactly? It’s the way a diamond (or other stone) is placed in or held by the gold or platinum mount and can affect the overall brilliance of the diamond, the style of the jewellery piece and the vulnerability of the diamond. Whether you’re shopping for rings from an engagement collection or having a bespoke piece made up especially for you, settings are a crucial part of any diamond ring design. Throughout the decision making process, you should keep lifestyle, budget and personal taste at the top of mind. The prong or claw setting is the most popular engagement ring setting and involves three to six metal claws that hold a stone securely in a metal basket. The prongs can be styled to be rounded, pointed, flat or even V-shaped and act as “pockets” for a square stone’s corners. When deciding between the most popular four and six prongs, remember that four prongs will flaunt more of the diamond, while six prongs are safer, but can also overpower a small stone. If you have a heart-, marquise-, or pear-shaped stone, be sure its points are cradled in a V-shaped prong for protection. Flat prongs are recommended for emerald-cut stones. Allows the maximum light exposure from all angles, optimising the diamond’s brilliance. Allows for easy cleaning of the stone. Holds not only strong diamonds, but also softer stones securely. Suited to classic, clean styles like a single solitaire engagement ring. A Bezel setting can be described as a metal border with edges that fully or partially encompass the perimeter of the stone. As the surface of the ring is smooth, it is a secure setting that protects the stone’s girdle from being nicked or chipped and is a clever choice for those with an active lifestyle. Holds a diamond securely in place. Metal can be moulded to snugly fit any stone shape. Popular for wedding bands, the channel setting slots a strip of stones – with no metal separating them – between two metal channels for the entire or a portion of the ring. Usually round brilliant cut or square diamonds are used in a channel setting, and we advise leaving at least a third of the ring unset to allow for easy resizing. The surface is completely smooth and practical for everyday wear. The French word for “paved”, a pavé setting involves three or more rows of small stones fitted into tiny hollows that set them level with the surface of the ring. The surrounding metal is then raised to form small beads that secure the gems. The setting can be flat or domed. Gives the illusion of having more and bigger diamonds. In the case of the challenging tension setting, pressure caused by the metal holds the stone firmly in place and gives the impression that the stone is floating. Only extremely hard stones such as diamonds can withstand the pressure that the tension setting requires. The iconic Shimansky Millennium ring is a semi-tension setting that has the dramatic appearance of a true tension setting, with added security for the diamond in the form of a basket below. The diamond is exposed to plenty of light which enhances its appearance. The distinctive design is innovative and modern. Also known as a micro-prong setting, microsetting involves a collection of tiny diamonds that are either incorporated into a plain band or accompany a larger diamond, adding to the overall brilliance of the piece. Where pavé set diamonds create a smooth, paved effect on the surface, microset diamonds are raised, and held in place by tiny claws. 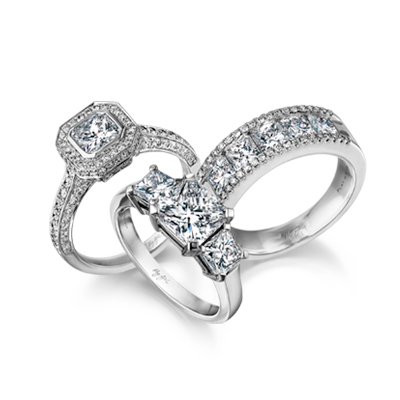 the dramatic appearance of a true tension setting, with added security for the diamond in the form of a basket below. Enhances the perceived size of the main diamond. For those who wish to minimise the exposed metal, microset diamonds on the shank add to the overall sparkle of the piece. A popular choice for men’s wedding rings, in a swiss or gypsy setting the stone sits in a hole in the ring so that it does not protrude from the metal at all. The metal is then pressed and hammered around the perimeter of the stone to secure it. Secures the stone safely in the ring. The ring surface is smooth, making it a practical and understated setting.